In this year’s Budget, the Federal Government has committed record levels of education funding. From child care to schools, higher education and crucially, skills pathways, we are supporting a world class education and training sector for all Australians. As the Assistant Minister for Vocational Education and Skills, I’m passionate about vocational and technical education so I’m very proud of our major Budget announcement on skills, a new $1.5 billion Skilling Australians Fund. For too long, too many people have seen that the only option for a post-school education is university. While university is a critical element of our education system, a vocational and technical education should be as prized as a university degree. The Skilling Australians Fund will create up to 300,000 more apprentices over four years while giving Australians more pathways to get the education they need to succeed. It will help deliver the skilled workforce Australian employers need to fill skills gaps and enable their businesses to grow. This will give Australians the best opportunity to fill Australian jobs, rather than relying on overseas qualified workers. Importantly, the Skilling Australians Fund will be permanent. It is underpinned by long term funding with the states to match funding to support apprenticeships unlike the previous National Partnership Agreement on Skills Reform. We will also create a new $60 million Industry Specialist Mentoring Program that will provide extra support for around 47,000 apprentices. This means apprentices and trainees in industries undergoing structural changes will get access to highly skilled specialist mentors with industry expertise. This intensive mentoring, targeted at but not limited to apprentices from regional areas, retrenched workers, long-term unemployed and mature-age people, will stimulate the supply of skilled workers. These key Budget measures are the result of extensive consultation with frontline workers, industry and employers and are an example of what can be achieved when we work together. The recent Australia-India Education and Skills Mission to India, led by Senator the Hon Simon Birmingham, Minister for Education and Training, gave approximately 140 education, research and training delegates the opportunity to explore ways to strengthen the Australia-India education and training relationship, and contribute to global skills and knowledge. 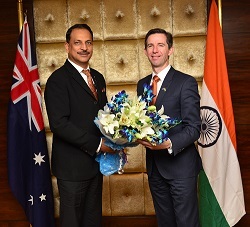 Minister Birmingham said the Turnbull Government had secured important progress on key education issues following meetings and discussions with India’s Prime Minister Narendra Modi, the Minister for Human Resource and Development Shri Prakash Javadekar and the Minister for Skill Development and Entrepreneurship Shri Rajiv Pratap Rudy. Read the Media Release. During the mission, Minister Birmingham and Minister Rudy addressed almost 300 delegates at the Australia-India Skills Conference, Skilling a Global Economy. Read Minister Birmingham’s speech. Skills Service Organisations (SSOs) – their name says it all. These organisations provide a valuable, independent service to industry by consulting widely on the skills Australian businesses need and translating this into training packages for use in the vocational education and training sector. There are six SSOs and they work on behalf of a network of more than 60 industry-specific committees, called Industry Reference Committees (IRCs), to identify skills needs and develop training packages. The SSOs came together on 19 April in Canberra with representatives from the Australian Skills Quality Authority (ASQA) and the Australian Industry and Skills Committee (AISC) Secretariat to collaborate on how they can better support industry’s skills needs – now and in the future. Representatives from the SSOs and AISC Secretariat discussed the outcomes of the AISC meeting on 11 April and the feedback provided by IRC Chairs in March. They explored how to make training packages more responsive to the needs of businesses, ways to streamline processes and procedures to bring training packages to market faster, and how to engage more effectively with industry, especially small businesses. The meeting was chaired by Kathryn Shugg, Branch Manager of the Department of Education and Training’s Industry Advice Branch. The Branch’s role is to help the AISC carry out its work and achieve its objectives – and a key aspect of this is engaging extensively with IRCs and managing the funding agreements for their SSOs. The six SSOs are SkillsIQ, Artibus, PwC’s Skills for Australia, Innovation and Business Skills Australia (ISBA) Manufacturing, Skills Impact, and Australian Industry Standards (AIS). SSOs are part of new training package arrangements, led by the AISC, that give industry a stronger voice in shaping the skills of the Australian workforce. Visit the website to find out more about the AISC. The USI Transcript Service will be activated very soon. The USI Transcript Service will allow USI account holders to generate a transcript which collates all nationally recognised training details reported to the national VET collections since January 2015. Transcripts will not replace the qualifications or documentation issued by training providers, but may be a useful backup for when original documentation is lost or where documentation cannot be obtained from the training provider, for example if they have closed. The option for students to provide online access to this data is likely to assist training providers with enrolment processes, credit transfers and entitlement assessments. Individuals may also use this service to provide evidence of their skills when applying for jobs. The benefits of this initiative for training providers and students will be modest at first but build over time as more training records are added to individual transcripts. Further USI Transcript Service information for training providers is available on the USI website and student information is available here. The Australian Government has commenced a review of the methodology used to determine the VET Student Loans approved course list and loan cap amounts. The terms of reference for the review and an associated discussion paper are available on the Department of Education and Training website. appropriate processes to update the eligible course list and loan caps. Consideration will be given to ensuring the program is well placed to support the ongoing skills development needs of Australian workplaces. The review will also explore loan cap amounts based on the efficient cost of delivering quality training. Online submissions to the review can be made until 30 May 2017. The review is expected to be completed within the third quarter of 2017 with any changes being implemented from 1 January 2018. Please email VSLMethodology@education.gov.au if you have any questions regarding the review process. 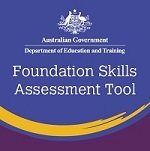 Registered training organisations (RTOs) and senior secondary schools that need to assess the foundation skills of their students to better target support now have another option available to them: the Foundation Skills Assessment Tool (FSAT). Funded by the Department of Education and Training, FSAT is an interactive and free online tool designed to identify and measure an individual’s foundation skill levels (English language, literacy and numeracy skills as well as employability skills). These skills are fundamental to participation in the workforce, the community and in adult education and training. FSAT assists in identifying any gaps in skills and knowledge that need to be addressed. This will enable trainers to target assistance to students in the areas where individuals may require additional support. The department is currently working with the Australian Council for Educational Research (ACER) to finalise and validate FSAT. During this validation process, the tool will provide trainers and educators with a valuable indication of a learner’s foundation skills. FSAT was made available to RTOs and senior secondary schools (for Year 11 and 12 students) in September 2016. While there has been strong interest from RTOs and senior secondary schools to date, the department is keen for more RTOs and senior secondary schools to use the tool. By participating, you will be helping to ensure that a fully validated, final and free version of FSAT is available as quickly as possible. Further information about FSAT, including answers to ‘Frequently Asked Questions’ and guidance on how to register, is available here. Representatives from WorldSkills Australia joined the Australian Government Minister for Education and Training, Senator the Hon Simon Birmingham in New Delhi for the recent Australia-India Education and Skills Conference. WorldSkills Australia CEO Brett Judd said the visit was a prime opportunity to promote Australia’s VET system, showcase outstanding young Australian skills people to the world and establish better trade links with Indian colleagues. WorldSkills Australia is looking forward to reciprocating the exchange in July when welcoming WorldSkills India counterparts to Australia to compete in the Global Skills Challenge. Read more. VET/TAFE Students: How do you feel about your course? Swinburne University are currently undertaking a survey into students’ satisfaction with VET courses to better understand why they complete or discontinue their studies. You are welcome to provide this link to any students (aged 18 years and over) interested in completing the online survey. The week encourages, informs and inspires people of all ages to explore the benefits of undertaking Vocational Education and Training while highlighting the opportunities and successful outcomes leading from trade and skill based careers. National Skills Week has demonstrated the capacity to consistently find innovative ways to extend positive messaging; influencing the way people think, raising the status of practical and vocational learning and enabling Australians to gain a greater understanding of the opportunities and their potential. Be part of it; get involved today as a supporter of National Skills Week. Find out more on the National Skills Week website or by emailing SkillsOne. The Skills and Thrills Careers Showcase takes careers advice out of the office and onto the stage, through an exhilarating showcase packed with music, film and theatre. Find out the latest on jobs of the future, industry trends and connecting your passion to a successful career outcome. 3 November – Wagga Wagga. For more information on the Skills & Thrills showcase, email SkillsOne. It's not too late to apply for a Bert Evans Apprentice Scholarship. Apprentices facing financial hardship while pursuing trade qualifications can apply for a Bert Evans Apprentice Scholarship worth $5,000 per year over three years. Up to 50 scholarships are awarded annually including 10 NSW Country Apprentice Scholarships. Applications close COB 5.00 pm Tuesday 30 May 2017. More information is available on the Training Services NSW website. Looking for a snapshot of apprenticeship and traineeship trends in Australia over the past 20 years? The National Centre for Vocational Educational Research’s latest research summary finds the proportion of adult apprentices is increasing. Those aged 25 and over now make-up 28% of trade, and 45% on non-trade apprentices and trainees in-training – compared to 8% and 22% twenty years ago. The proportion of adult apprentices completing a trade apprenticeship in two years or less has also increased in the last 20 years, signifying the growing importance of alternative pathways and delivery models. For more information read the research summary, or explore the infographic. WorldSkills Australia recently appointed three new board members: Megan Lilly, Head of Workforce Development at the Australian Industry Group (Ai Group), Stuart Henry, Principal of Aqua Global Consultants and Trevor Schwenke, the newly-appointed CEO of Bendigo Kangan Institute. Read more. The search is still on for Australia’s best in vocational education and training, with less than one month left before applications close for the 2017 Australian Training Awards’ ‘direct entry’ award categories. International Training Provider of the Year Award. Entries for these award categories close Wednesday 31 May 2017. The remaining Australian Training Award categories are the culmination of state and territory training awards, with winners from each state and territory eligible to compete at the Australian Training Awards in aligned award categories. Australian Capital Territory Training Awards (close 17 May 2017). Skills Impact, on behalf of the 11 Industry Reference Committees (IRCs) they support, have completed work on 8 2017 IRC Skills Forecasts and Proposed Schedules of Work. These documents, which are reviewed annually by the IRCs and undergo consultation with industry, were submitted to the Australian Industry and Skills Committee (AISC) in April and can be viewed on the Skills Impact website. The documents identify skills gaps and emerging skills needs within industry and determine whether there is a need to change training packages. The AISC draws on this information to update their AISC National Schedule and determine future Training Package Projects. Skills Impact will continue to receive feedback on these Skill Forecasts on behalf of the IRCs. Please feel free to email any comments or feedback about the current documents to inquiry@skillsimpact.com.au so this information can be considered in the 2018 drafts. 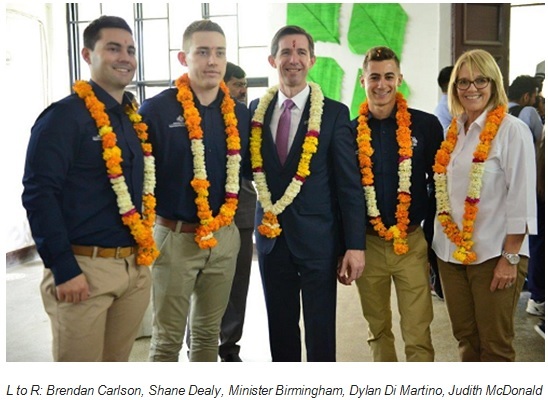 Last month, a WorldSkills Australia (WSA) medallist and three Australian Training Awards (ATA) alumni joined Senator the Hon Simon Birmingham, Minister for Education and Training's Australia-India Skills Delegation to New Delhi. The WSA and ATA participants showcased Australian VET and promoted the benefits and values of skills-based training through engaging with other delegates, participating in a panel discussion, and sharing their personal training stories. The trip to India included an interactive session with WorldSkills India experts and trainers who are preparing for the October WorldSkills International competitions in Abu Dhabi. After six years in the Australian Defence Force, Brendan made the difficult decision to change careers. Twelve months with an electrical company as a fly-in fly-out trades’ assistant gave him valuable industry experience which led to an Electrical Instrumentation Apprenticeship with Chevron through Apprenticeships Australia. In addition to his work on the Gorgon natural gas project, Brendan takes opportunities to provide support to young people as a mentor for Leading Youth Forward, a community charity providing positive experiences and role models for at-risk teens. Brendan was recognised for his outstanding contribution to vocational education and training at the 2016 Australian Training Awards where he was a finalist for the Australian Apprentice of the Year Award after being named winner of this category in his home state of Western Australia. He is an Australian Apprenticeships Ambassador. 18 months into a university Engineering Degree, Shane realised it was not the right career path for him and switched to his first love, carpentry. He gained his apprenticeship while working for his father’s firm Algoa holdings and studying at the Canberra Institute of Technology (CIT). In 2016, Shane was named the Australian Training Awards Australian Apprentice of the Year for being outstanding in all aspects of his trade. Shane is particularly passionate about the opportunities that can be gained through vocational education and training and wants to be an ambassador for VET. As an Australian Apprenticeships Ambassador, he wants to demonstrate how fantastic a trade can be, visiting schools and giving impressionable young people in Year 10 or 11 a more complete picture of the options available to them. After five years as St Clare’s College’s Facilitator of VET, Judith became the college’s VET and Careers Coordinator. Since then, an increasing number of students at the college have been awarded vocational certificates – 102 in 2013 compared to 37 in 2008. Judith is also a passionate, dedicated and inspirational teacher of St Clare’s children’s services courses. With her expansive knowledge of local industry and employer links, she works closely with employers and is a passionate advocate of education pathways for students, including those at risk. Judith’s willingness to support students in their studies has led to many successes at the ACT Training Excellence Awards. She is a firm believer that students’ achievements encourage and inspire others to consider the opportunities that VET offers. Judith was a VET Trainer of the Year Finalist at the 2014 Australian Training Awards. Following his Bronze Medal success in the 43rd WorldSkills Competition in São Paulo, Brazil, WorldSkills Australia has remained very much part of Dylan Di Martino’s life. 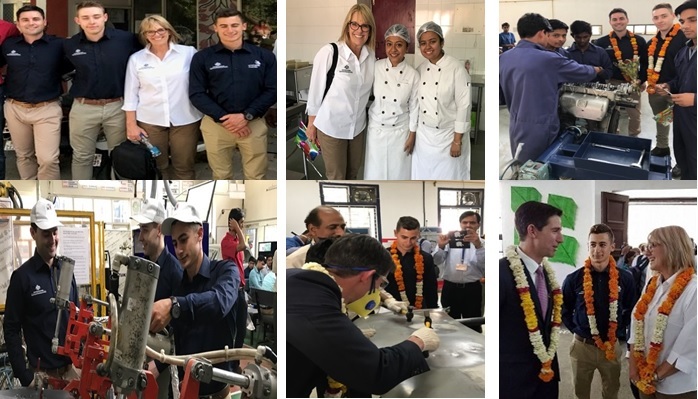 The 2015 Skillaroo’s recent trip to India with WorldSkills Australia to showcase the best of the Australian VET system is just one of the ways Dylan has continued to promote the value of skills training. Since winning in São Paulo, Dylan has returned to the competition floor as a Judge at WorldSkills Australia Regional Competition in Plumbing for the Melbourne Region and was the first finalist from the TAFE sector for the ‘Student of the Year’ award at Victoria University. Dylan was also one of the faces behind the 2016 WorldSkills Australia National Competition, Melbourne campaign. Have you got a problem with your training? Call the National Training Complaints Hotline on 13 38 73 and select option 4. A referral service for the training sector. Email for more information. Find out about the best Registered Training Organisations in your state or territory. VET Alumni members comprise Australia’s best VET students, businesses, teachers and registered training organisations. They know first-hand the value in investing in VET as either a career, to grow their business or to enhance their training services. Visit VET Alumni to find out more. Find information about upcoming VET related events, including conferences, careers expos, workshops and other activities by visiting the Calendar of Events. A selection of VET related tools and resources at your fingertips. If you would like to provide feedback, supply an article for inclusion in the next edition or join our list of subscribers, please email skillsatwork@education.gov.au. The next edition will be published in June 2017. Submissions are due by Monday 22 May 2017. The views expressed in articles contained in this newsletter, submitted by individuals or organisations external to the Department of Education and Training or the Australian Government, are the views of the individuals or organisations offering those views and do not represent the views of the Department of Education and Training or the Australian Government. This information is presented by the department for the purpose of disseminating information to subscribers. The department does not make any representation or warranty about the accuracy, reliability, currency or completeness of material contained in this newsletter. The department is not liable for any loss resulting from any action taken or reliance made by you on any information or material included in this newsletter (including, without limitation, third party information). The department does not make any representation or warranty about the accuracy, reliability, currency or completeness of any material on any linked site. You should exercise your own independent skill and judgement before you rely on the material on any linked site. Links to other websites are inserted for convenience and do not constitute endorsement of material at those sites, or any associated organisation, product or service. You obtain access to linked websites at your own risk and the department accepts no responsibility for any interference, loss, damage or disruption to your own computer system which arises in connection with your use of any linked website. You must take your own precautions to ensure that the process which you employ to obtain access to this website does not expose you to the risk of viruses, malicious computer code or other forms of interference which may damage your own computer system.